PHILADELPHIA – Boston Celtics guard Marcus Smart was ejected less than a minute into the third quarter of Wednesday night's game against Philadelphia for a two-handed shove into the back of 76ers star Joel Embiid. "Obviously I was frustrated, because it was a cheap shot," Embiid said afterward. "I didn't see it coming. It caught me off-guard.
" But, I mean, I really don't want to talk about it. I don't care. " 1:08 mark of the third quarter while trying to steal a pass for the All-Star center on the perimeter. Two seconds later, After Boston ended up following the stoppage in play, Embiid caught Smart trying to go with him with what appeared to be an elbow in the left rib cage. Smart then fell to the ground, but no call was made. As Embiid Then started to walk away, Smart stood up, took a step and gave Embiid a two-handed shove in his back, with both arms fully extended. That sent Embiid sprawling to the ground in the corner, and he immediately leapt to his feet and Try to rush back to Smart, with officials, coaches, security guards and players from both teams preventing things from escalating further. After a lengthy review, the officials hit Smart with a flagrant foul 2 – resulting in an immediate ejection. "We needed him out there," Celtics coach Brad Stevens said of Sm art, who left without speaking to reporters. "Don't be wrong: We love all that Marcus is. And part of Marcus is his fire.
" As you know, a time or two a year, it gets the best of him. But this is just a reminder of how important it is. He knows how we all feel and he knows we all love him. That's just part of it. It's part of a long season. " As the call was announced, Smart was cheered off by the fans in Philadelphia, and raised his right hand to the crowd on as he walked through the tunnel and back to Boston's locker room. "Stuff like that, it gets me going, it gets the crowd going," Embiid said. "And everybody knows that I play better when the crowd is involved. So that energy was definitely good for us. " 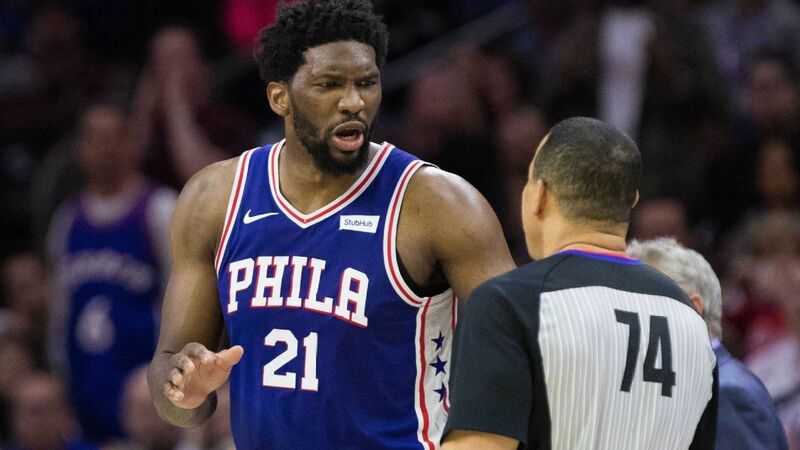 Embiid, meanwhile, was hit with a technical foul for his role in the play. Kyrie Irving hit the technical free throw for Boston, but Embiid hit both of the free throws that came with the blatant, and then made a layup to turn it into a four-point possession. – one Philadelphia would go on to win 118-115, giving the Sixers their first win over the Celtics this season. "I actually thought we had started to get a bit of a rhythm and then momentum a little bit towards the end of the second quarter, and felt that too at the beginning of the third, "JJ Redick said." It probably helped us from a point differential standpoint, because we were able to get to the free throw line and knock down a couple of free throws. " Embiid led all scorers with 37 points t o go along with 22 rebounds, as well as a huge block on a drive by Irving in the final minute of the game. and show that I'm the most unstoppable player in the league, "Embiid customs ESPN's Cassidy Hubbarth following the win.